Superman is at the mercy of Lex Luthor, on Luthor's Kryptonite Fortress/Island. Wonder Woman arrives and lasso's Superman from the island, and takes him back to the Fortress of Solitude in the Antarctic. On New Krypton, General Zod intercepts Jor-El and Lara as they fly to the hospital as Lara is ready to give birth to her and Jor-El's second�baby. Zod taunts Jor-El that the Phantom Zone may have altered Lara's body. Brainiac listens from a far. Meanwhile a Composite Superman/Batman appears in Central City, and the Flash attempts to stop him. Composite Superman/Batman is too strong for him, and Flash runs away to Batman who is looking on from a roof top. Just then a bandaged up Superman from the future turns up and begins to battle Composite Superman/Batman. A rejuvenated Superman also turns up and Batman, Flash with help from the future Superman manage to stop the future villain. Batman tells the rest of the heroes that the Composite Superman/Batman was after a Kryptonian, and Superman figures out that its Lara's unborn child is who he was after. On New Krypton, Jor-El sits in the waiting room, as he awaits the birth of his new child, when he is called into the delivery room, he is shocked to see Lara cuddling a new born Brainiac baby. Story - 5: I really don't know how to grade this book. Again, I am not the target audience for this particular mini-series, and it's not what I would pick up at my local comic store, but it has elements that make me almost wish that would explore in the regular books. Such as Brainiac and Superman having a biological connection to each other. 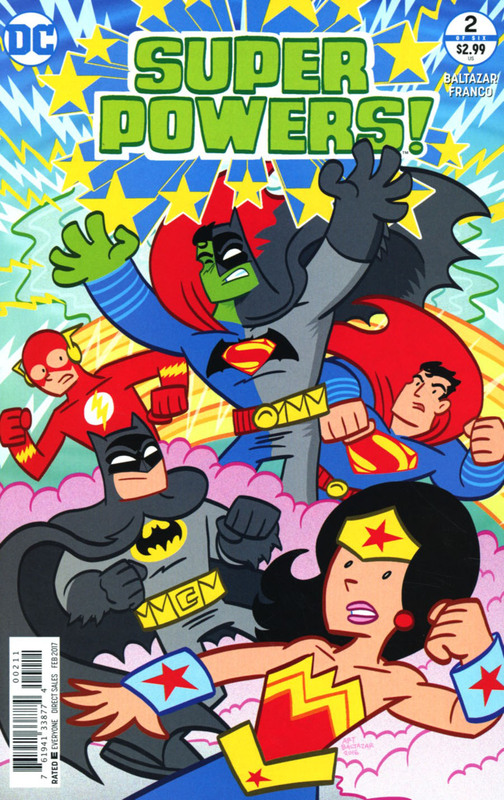 It seems that Art Baltazar & Franco are running with all sorts of plot elements from Superman history, and meshing them together, and surprisingly making it work. So far they have elements from The World of New Krypton, All Star Superman, Superman: The Movie, Superman Returns, the Silver and Bronze age. I like that Superman is still the main focal point of the story, which for any fan of Big Blue is a blessing of sorts. Looking forward to the next issue. If you have young kids, perfect way book as an entry point into comics in general. Art - 5: Like I said last month in my review of issue #1, the art style is very simplistic, almost as if it belonged on a Saturday morning cartoon. I really liked the shape of Lex Luthor's head, has an almost 1980's Hanna Barbera quality to it. The pacing is really good, and is easy to follow the story. Even though it is so simple, I like the art. Well done team! Cover Art - 5: I like the cover very much. It gives you a hint at what to expect this issue. Good composition.